Inexpensive golf promotion or compliment another item, utilize the latest promotional golf tees, the Tall Golf Tee. Extra tall is what the golfer's want to tee off and on the course as the tall tees are adjustable for any golf shot. 3 1/4" High Wood Golf Tees are the tallest promotional golf tee available on the planet. Bulk packed in carton. You may specify a Light Color assortment, Orange, White, Yellow and Natural Wood with Black Imprint. You may specify a Dark Color assortment, Red, Black, Dark Blue and Dark Green with White Imprint. 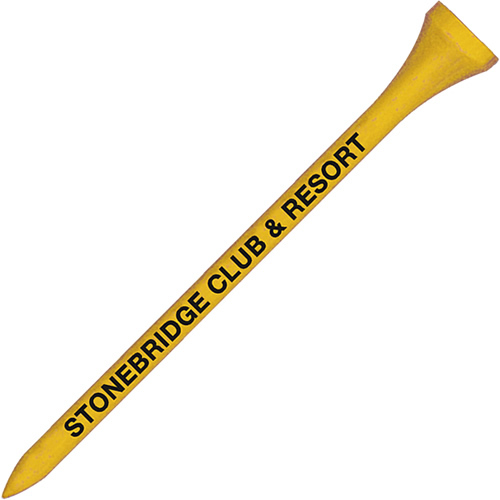 You may specify one golf tee color with the standard imprint color of your choice as well. Delivery from date of order for this golf promotional item is 3 weeks. The price includes a one standard color imprint in an area 1 1/2" W x 7/16" H.
Factory screen charge is $35.00. Multi color imprinted is not available. We will set type for your advertising in a stock font at no charge. Tall golf tees has a maximum of a one color imprint.